I went to the USDF convention in Denver, CO and collected Gibraltars Year End Award for being Champion again in the Prix St.Georg with Debbie Hill for the International Andalusian and Lusitano Division. I also attended 3 Days of Kyra Kirklands Symposium, which was just outstanding. Gibraltar and Caroline Humphries had a great showing at the Regional Championships at Poplar Place near Columbus, Georgia. On Friday she showed Gibby in 3rd Level Freestyle and they repeated his Free Style Championship success for a 3rd year in a Row. 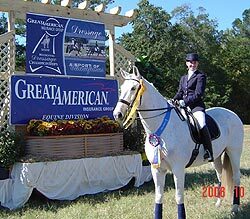 Caroline competed still as a JR/YR rider and defeated 5 other rider/horse competitors. On Saturday she rode a 4th Level Test and won with a 65.116% in a class of six. On Sunday they placed 3rd out of 16 in the 3rd Level Championship for Jr/Yr. Congratulations Caroline and Gibby. Debbie Hill and River Side Lady had also a successful weekend. On Friday Morning in a driving Rainstorm and the Ring under 2 inches of Water, Debbie was first out. She and River Side Lady were able to win the Reserve Championship in Training Level Open out of 18 particicpants. On Sunday the pair was able to secure the Championship in First Level Open with 29 competitors in the class and the 2nd Rider to go. Congratulations to Debbie and FOXBERRY Farm. Brocken met Carol Kelly of Chapel Hill, NC during our trip to the CDI in Raleigh. Carol fell in Love with Brocken and tried her out immediately. On July 1st, 2008 Carol became the new Owner of Brocken. We wish her & Brocken lots of fun and great success. 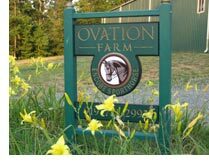 Brocken's new home will be at OVATION FARM in North Carolina, see attached pictures of proud owner Carol & Brocken. 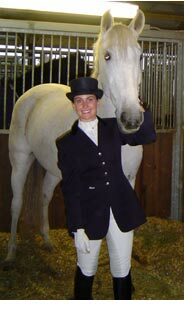 Gibraltar will also have a new rider, Caroline Humphries. Caroline has been training with Debbie for many years and they traveled to Memphis,TN together to give Gibby his first rides with Caroline. They accomplished their task and received qualifying scores. The pair will try their first Freestyle at the Ole South competition in August. 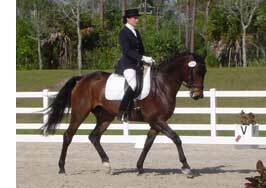 Winterwillow and Fabelhaft had extensive Training by Joe Schomburg from Wellborn Quarterhorses. He teaches the "Buddy" system a la Parelli and others. They really have matured a lot and should be ready for "under saddle". We traveled to Raleigh/Durham to compete in the CDI event on May 30th through June 1st,2008. Gibraltar placed 2nd, 4th and 6th in his PSG classes (as many as 17 entrants per class) with his best score of 66.500%. Brocken placed 2nd in a 3/2 class with a score of 63.846 and also 2nd in a 4/1 class with a score of 64.884%. The Highlight of the Show was Debbie's win with River Side Lady on Friday in the 5 Year Old FEI Test and Sunday they were RESERVE Champion in the 5 YO Finale Test for the Markel Young Horse Selection Trial. Congratulations "Berry" and owner Robby Rice. Brocken is ranked at this time 4th in the HOY USDF for Third Level Open with a score of 68.0445 and First with the American Hanoverian Society. Gibraltar and Brocken showed well at the TRI State shows in Cleveland,Tn. Gibraltar won his three PSG classes with the best score of 66.5%. Brocken also received three Blue, one Red Ribbon with the best score of 69.535% in Third Level Test 3 and also won her Fourth Level Test 1 with 65.118%. 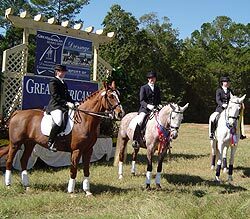 Brocken was also awarded High Point American Hanoverian award for one show. Gibraltar got his qualifying scores in PSG with 62.750% and 63.0%. There were 37 Entries in the PSG classes with Top riders like S.Harding, C. Hickey, Jan Brons etc. He placed 22 out of 37. Brocken competed in 3rd Level and placed 1st, 3rd and and 7th with at least 15 to 17 riders in the class. Her scores were from 66.744% to 70.769%. 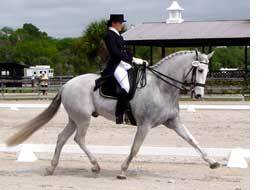 The next competition was at Fox Lea Farm in Venice,Fl., where we competed in the Florida Dressage Competition on February 22-24.
for the Regional Championship at Poplar Place, Atlanta, Ga.
in her first 4th Level Test. I have to mention Debbie's wonderful results with River Side Lady, belonging to Robbie Rice. In her Training Level Test 4 they achieved the score of 86.4% and in her F5 FEI Test the score of 8.32. (top in the Nation at this time). What a weekend! 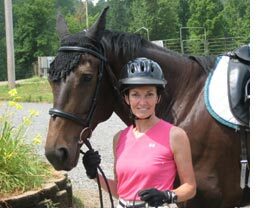 Not to forget Debbie broke her foot after the event and we hope she is back in the Saddle soon.